Shorter and easier, but still requires some steep climbing on your way back out of the valley. Suitable for the active family. Guaranteed game viewing! This route has an additional descent and climbs over and above what the 5km course covers. Some incredible forest and grassland, a short section of single track (some purpose cut and other animal track). One of the toughest 18k around. A great challenge and incredibly rewarding. All those who take on the challenge will be well rewarded at the finish with a breakfast roll and a breathtaking view over the valley. Once sold out, NO LATE ENTRIES AVAILABLE. Pre-entries close at MIDDAY on Thursday 20 June. Entry includes entry into the game reserve, a breakfast roll, 1 x free entry to Reptile Park and 10% shopping discount on the day. Registration from 6:00 – 7:30 am. Please arrive with plenty of time to process your registration. Once entries are sold out, substitutions will be allowed until NOON on Thursday 21 June. Substitution fee of R50 applies and is payable on the day at registration. 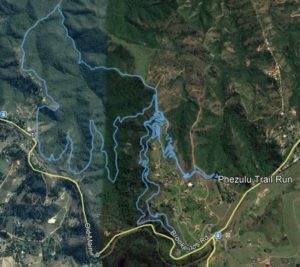 Please email info@kzntrailrunning.co.za confirming that your entry has been substituted with details of the name of the person who will be taking it over. 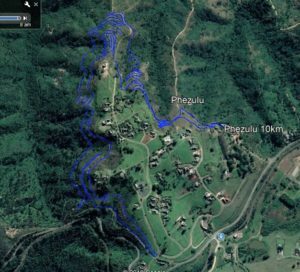 A tough race no matter what distance you choose, the 3 courses at Phezulu need to be treated with respect! The routes traverse through a game reserve and animals such as Giraffe, Zebra, and Wildebeest are regular spectators on this trail. The hilltop grasslands are wide open and the valley bush is thick – considering the venue is so close to Durban and Hillcrest, you could not ask for wilder. 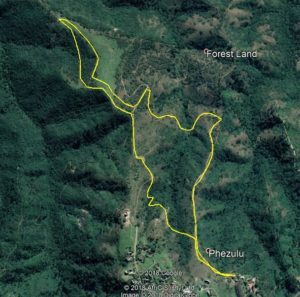 The Phezulu field team are constantly working on these trails to provide the best tracks possible! Venue: Phezulu Safari Park, Botha’s Hill. – At T-Junction (Set of robots) turn left, this is Old Main Road (R103) ± 7km. – Phezulu is on your right-hand side. – Take left-hand side off-ramp marked Cato Ridge. – Continue along this road until you come to a left turn marked Inchanga/Valley of 1000 hills ± 8km. turn left, into Phezulu grounds.